Addie Bella Boutique | Etsy Giveaway! I was lucky enough to review products from a newly opened Etsy shoppe: Addie Bella Boutique! Julie, the shop owner, has been so lovely to work with. She asked me which items I'd like for little Miss Brynn. I picked one pretty little headband and then told her to surprise me with the other. Thank you so much, Julie, for allowing me to review your amazing shop! And now? It's your turn, my wonderful readers... Julie is graciously giving away a $25 credit to use towards anything in her shop! All you need to do to enter is visit Addie Bella Boutique and then come back and leave a comment telling me what you'd use your $25 shop credit for if you win! Don't forget to leave your email address! Vote if Brynn made you smile! I'd love to get the baby headband with the light pink flower and netting! so cute! ohh it's so hard to choose what i'd buy! 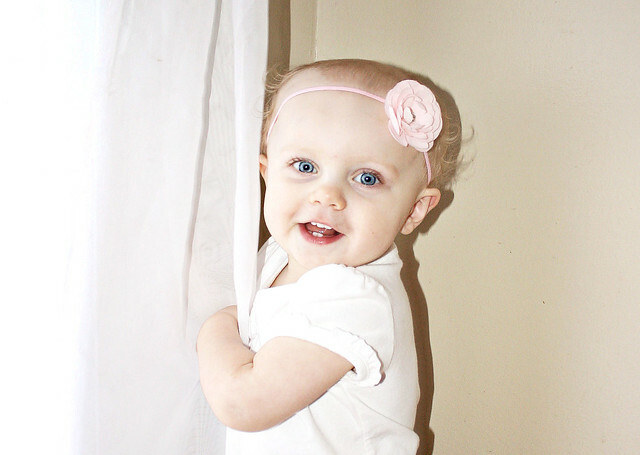 i know my little girl loves the color pink so the Hot Pink Satin Flower Headband is perfect! Baby Headbands Flower Headband Trio. So hard to choose! I love the Deep Red Rose Headband and the shabby flower ones, too! I love love the feather and the shabby flowers. I hope I win! I would get the Baby Headband Pink Feather Pad! So cute! I love the Pink and Cream Flower Headband. So cute! I love the Green and also the Gray - perfect for fall! I would buy the Ivory Flower Headband. Too cute! I just love the simple white headband! Cute pics, happy girl! I'd get some of the newborn sized headbands. Perfect for my sweet girl's head of dark hair! I would love pink and cream flower headband! Or the hot pink flower on damask! So cute! So many cute handbands! I love the ivory flower headband! I love them all! I have to pick just one? I think my favorite is the hot pink headband with rhinestones on damask print! I really, really want to win this one! hmm....hard to choose! I'd totally want it for me, and i adore the one that Brynn is wearing in the second picture. I'm thinking the purple and lavender one!! I would totally love to get my niece some of those precious head bands! How adorable are they!? 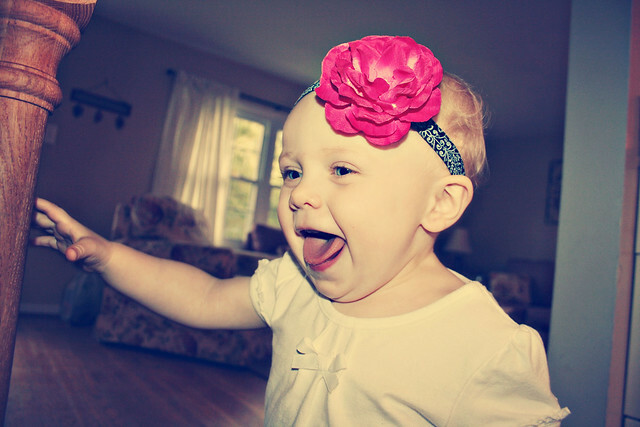 I love the red flower head band - my Brynn is really into her headbands these days, too! they're all so cute! I like the ivory flower headband and the deep red rose! I like the deep rose headband. Oh wow. I could NEVER pick just one. But my favorite is probably the Hot Pink Satin Flower Headband...we are BIG pink fans in our house. Ohhhhhhhhh!!!! There are SO many to chose from that I LOVE but I'd definitely use my credit towards lots of skinny headbands for my girls. I especially love the skinny headband with the ivory puff flower. I like the bright green and the grey silk. There's a Navy and two Purple ones I would buy!! I love her stuff! Especially the deep red flower headband! Love it! Brynn looks adorable! All the headbands are cute, but I'd definitely have to pick up at least the deep purple headband. I'd get the "Baby Headband - Light Pink Flower Headband - Feathers Russian Veil - Newborn Baby Headband"
I love the purple baby headband for my 6 month old daughter. Headbands for my bald baby girl! woops, forgot to do the entry earlier in my comment! I would definitely get a few baby headbands for my baby girl arriving in November. The feather pad headband is really cute, too! i love the gray satin headband! I love LOVE the hot pink on Damask for Mackenzie Lynn among everything else, this site makes me want to get a second job. Adorable Etsy Seller! Cute headbands! I would get a baby girl flower headband that was the pink cream color. I would get the flower headband trio - so pretty!